Rapid Learning – disciplined application of the scientific method to explore the best ways to deliver valuable results. Early Return on Investment – opportunity to use the results of work starting with the work delivered at the end of the first iteration. Satisfied Stakeholders – engagement in the process in a way that allows meaningful contributions from all stakeholders. Increased Control – mechanisms to track/measure and therefore steer the direction that work is going so that it meets goals. Responsiveness to Change – processes, tools, roles and principles that allow a team and an organization to embrace change rather than reject, control or suffer from change. These reasons are sufficient and apply to operations work, project work and open-ended research work, whenever humans are involved. The above links take you to more detailed descriptions of each of these benefits. What are some of the other benefits of agile? The fact that agile methods increase return on investment, accelerate learning, increase stakeholder satisfaction, and enable better control of work are all an interesting result of this final benefit: responding to change. Okay, here’s yet another draft of the Scrum Rules Cheat Sheet. I’ve added two optional rules, a note about Truthfulness as well as re-wording or clarifying a few other rules. This is an update worth checking out! I would love to hear comments from people about how well this is communicating, how useful it is, if there are things missing or if you have any other suggestions for changes. Thanks! This is the original article about the Scrum Rules Cheat Sheet. One of the reasons that agile provides stakeholder satisfaction is because of increased control. This increased control is a benefit in its own right. The word “control” must be used carefully… some agile approaches and practitioners are justly wary of the word and its common uses. This particular benefit of agile is often a little surprising to people how have believed the myths around agile that it is a chaotic-anything-goes type method. Let’s look at how an agile approach provides more control. In the ScrumMaster training, I include a diagram that has a simple idea: to map the areas of complexity in a problem based on two dimensions: Agreement and Certainty. This diagram is an adaptation of the diagram by Ralph Stacey found in this article called Aides for Complexity by Brenda Zimmerman. This diagram or model can be used to help us understand where and how agile methods can be applied. A team is a group of people whose personal outcomes are obviously linked to a collective outcome — such as a successful project — and who work together to maximize collective and individual outcomes. “Team” also refers to the quality of group relationships that allows ordinary individuals to achieve extraordinary results together — such as a project that surpasses its goals. So what exactly are the benefits of agile? 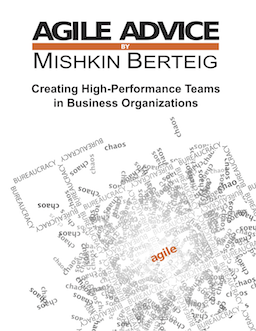 Why are people, teams and organizations so interested in agile processes? What about agile caused it to become a popular and rapidly growing approach to working? I have seen five essential benefits that come from implementing an agile methodology. Here I describe what I think of as the most important benefit of agile: rapid learning. After feedback and use in a number of different circumstances including training and coaching, Berteig Consulting has made a new Scrum Rules Cheat Sheet (pdf) available. Corrections to the old version include a “Basic Rule” about managing defects, as well as several changes to improve clarity.